This training courseware title provides everything you need to professionally deliver Intermediate Project Management training including editable training manual, hands-on exercises, exercise files, detailed instructor guide, classroom-ready PowerPoint slides, and unlimited online learning licensing. 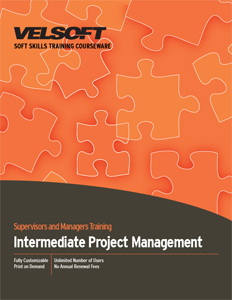 Seeing is Believing This sample manual to teach Intermediate Project Management is in MS Word format. Project management is a valuable skill for anyone to develop and build upon. including the work breakdown structures, scheduling, budgets, and risks. The complete project management lifecycle (including planning, executing, and closing a project) is covered. All Velsoft Training Materials courses are fully customizable to allow you great freedom and flexibility as a trainer. Download a free sample and take a look.